I didn’t sleep last night. I allowed my mind to wonder as I tossed and turned all night. I listened to thunder boom and the sound of rain as it came and went. “Did I cover the small electric BBQ pit” and other such thoughts rambled through my mind. Thanks cancer and chemo for another great night of keeping me awake listening to the sound of my wife getting her much needed rest. After all, she drives me most everywhere these days. I suppose my body will sleep when it is ready. We are smack dab in the middle of the “pre” transplant process. It is turning out to be perhaps the busiest we have ever been during either chemo event (2008 or this year). It has required more of us, traveling farther with longer days, and this is just the beginning. I’ll share with you the details of today so you can get an idea. Janice and I woke at 5am. We headed out through the rain and traffic to brave 114 to Dallas. Highway 114 is special. Especially bad. It is one of the worst drives I’ve done through any metroplex so far. Not as simple as it looks. HWY 114 is a hard drive, perhaps the hardest I’ve experienced in the Metro. Many fast lane changes, constantly merging, suddenly the road splits. One wrong turn costs a lot of time. 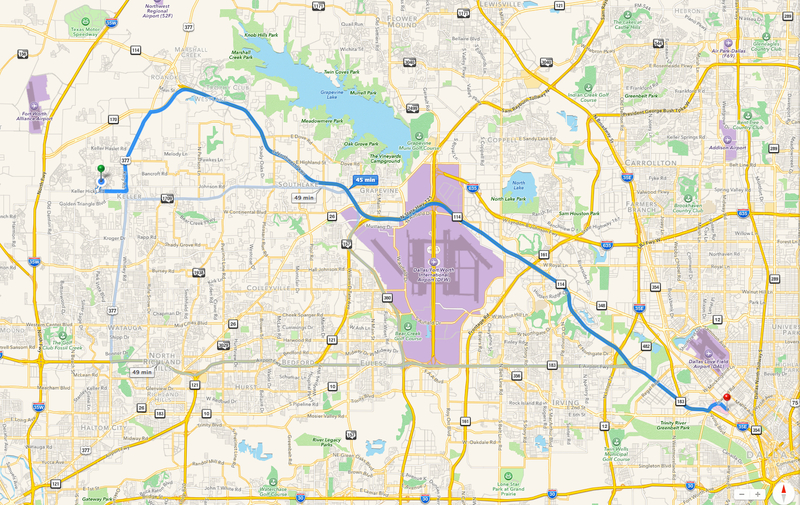 If one looks at a map, DFW metro is sort of like two big wheels, Fort Worth on the West/left, Dallas on the right/East. Most roads are typically North and South. Then there’s our friend Highway 114. It runs from Northwest to Southeast at an angle. It intersects every major everything it comes across. Therein lies the problem. “Move over two lanes to your right,” I tell tell Janice. “I’m trying,” she says. The stress is duly noted; she’s looking ahead as she tries to get right two lanes through traffic that doesn’t play nice. Trying to keep moving at 60 mph in the dark with rain, staring through the mushy windshield, while trying to see in the right side mirror if she can get in between the vehicles. Miss the lane changes, and off we go to another part of the metro. Repeat every 1-5 miles the entire 33 mile journey. Sometimes we have to move over left quickly 4 lanes, other times it is 1 or 2 lanes to the right. The lanes play down from 5 lanes to two as we merge with Highway 12 (hello Irving) near the remnants of the old Cowboys Stadium. Other times we are driving on two lanes only when we merge with an interstate and on our left is the sudden fast flow of four lanes that weren’t there just a few seconds ago. Very little warning. It is unnerving to say the least. Add rain in the dark at 6 am, you have our travel morning. In many ways, this is almost a representation of what it’s like to go through chemo and now this transplant business. Cutting across life, danger of being thrown in any direction, uncertain patterns make it hard to get our connections, but it is the most direct route. Physically demanding, constant changes, can’t see far ahead, trying not to hit or be hit on any side, and hoping we arrive safely. Trusting we arrive safely. Exhausted when we do arrive safely. We arrived at the location and couldn’t find this new (to us) center. We are both learning about the Medical District of Dallas. Impressive place. All we can see is this behemoth called “Children’s Medical Center,” yet our UT Southwestern destination is supposedly right here in the midst of this gaggle of buildings lit up with cheery neon lights. After our hair raising drive through rain, dark, and horrid traffic on gnarly 114, the final getting to our destination is a bit harder than we thought it might be. Turn here, go around the block, watch the traffic, look for the names, find the numbers, can’t see well through the dark, road construction is a booger, stay in the right lane, can’t stay in the right lane due to (fill in the blank for any number of reasons: busses, trucks stopped, strange signs saying we can’t stay in the right lane, huge car eating pot holes, add your version of fun), and add two 50-something people with less than ideal vision, tired, in an old van that is faithful (love our van), and — Janice, there it is, turn right now. No, not there, the next right. Don’t miss it or we have to circle around again this massive area. You would be amazed at the tight small pull-in locations for massive medical complexes that rise 14-25 stories. Huge place, yet only enough room for about 12 vehicles in the only entrance to the building we can find. The entrance can only be approached from one direction, requiring a trip around the block to get it just right. The turn in is almost impossible in our van (need a small car), navigate to the tiny circle where people are standing to park our cars, and that about caps off the stressful drive. We got to hang out for a couple of hours at an apheresis center. They can’t access my port until the consent is faxed from the other location from Friday where I received my blood transfusion. “Can I sign a new consent to speed up the process,” I ask Giovanni the RN (real name)? “We have to have the consent from Friday, they are faxing it over now” he responds. Eventually the consent arrives over the fax machine. The typical discussion begins. Get another RN to discuss why Robert’s unusual port (it is different, yea for Team Robert) is the way it is. No identifying bumps on the surface to guide the nurses for cannulation (sticking the needles in). Virtually no one has a “double lumen port” (catheter under the skin that has two openings instead of one). What size needle? Should we choose a 3/4 inch long needle or a 1 inch long needle? It always requires at least two nurses to mash hard on my chest for about 5 – 10 minutes to discern exactly where they think they are going to stick the needle in. Thanks Bard Manufacturing for not putting simple bumps to guide people who are having to use their fingertips and imagination to decide where to poke needles into my chest, thanks a lot! Giovanni was good. Got it on the first try. Usual second verse begins: why won’t it pull back blood? Heck, I don’t known. It has never pulled back blood unless you instill TPA every single time (medication to dissolve blood clots). I get some version of song and dance that begins about can they use the port if they can only push in saline, but not return blood. It is different in each location and based on the reason they are accessing my port. The RN decides he can simply draw blood from my arm for this visit. Great, another needle stick. Not a big deal, but he put on a very tight tourniquet, like the tightest I have ever had. Left bruising around my arm. Blood is drawn, usual bruise to the left elbow area appears, the port has been accessed, and now the downtime. Giovanni disappears from sight to the greater open area on the other side of our drawn curtain. Things slow down. Sleepiness starts descending on us both. I can see Janice slumping in the not-so-comfortable chair as my brain begins shut down process. The constant lull of chatter from the nurses station is almost comforting. My brain drifts to the memory of operating old apheresis machines. These here are so small and modern. Could I work in a place like this? I attempt to focus on the chatter from the nurses station, background communication I find interesting. I can hear my name thrown around a few times. The charge nurse and Giovanni are discussing why my values aren’t back. I can hear the usual phone calls to lab. The RN pops around the drape. “Evidently lab cannot run your blood until I log out of the lab section of my computer, ” Giovanni mumbles to Janice and me. He swipes his badge, logs into the computer, closes out the lab section, logs out, and disappears again. Strange glitch in the system if you ask me. Sleep hits us both as we fade into the bliss of having a moment of downtime. It is always cold in these medical places. I can see Janice snuggling in a bit tighter to her hoodie. I try to get every bit of the super micro-thin hospital standard issue bleached stiff blanket around all parts of my body. I brought a book to read, but can tell there isn’t enough brain power to focus on anything at this point. Sometimes these are the few moments of rest we get in an otherwise hectic day. It all melts together at this point as the brain gives up and the lack of energy combine to cause my vision to blur. I turn on my side and stare at Janice. She stares at me. No real anything is said or done, but communication occurs nonetheless. We are both happy to have a moment of rest and to not be driving on 114 at this point. Finally the lab results come back in. Giovanni flies around the curtain, stating “your blood is good enough you can go home today without a transfusion. Your next appointment is two days from now.” He “de-accesses” the port (pulls the needle out of my chest), helps us to gather our stuff, and out to face 114 we go. Much easier at 10 am with daylight and no rain. We are getting familiar enough with this difficult route to actually count lanes now. Any of the 3 left lanes (instead of just the left two) can be used initially as Janice and I merge onto 114. She has to cross over about 4 lanes to get to the left 3 lanes. Was easy this morning, but some days all 7-8 lanes are packed and getting over is not easy. We head to the house, discussing any options of what might need to be done while we are out. I grab the growing stack of bills and sort them out. The phone reminder from the hospital that we haven’t been paying them on time was my clue that both of us, in our tired-ness, have missed some bills. We both pass out after a few brief discussions. We have an appointment tomorrow (the RN didn’t know about that one), with my oncologist who I haven’t seen since this fast paced transplant process began rather abruptly last week. I suppose we will be “signing off” for a while with her. Can’t imagine any good reason to have to travel down I-35W into downtown Fort Worth (much easier drive, but super congested and busy with construction, brainless drive though) after tomorrow. I suppose our lives have become like these highways in some respects. Depending on the direction and purpose, some days seem easier. No matter the goal for the day, the distance is long. We find ourselves sleeping when we can as one day is starting to blur into the next. Transplant pre-screening is quite involved. This is just the beginning. According to the calendar they have given us, it will get busier, harder, and more intense before the final big BEAM chemo starts. My health is better compared with last week. The tongue has healed. The antibiotics have really made a difference. The unit of blood helped. Getting further away from my “nadir” has certainly been important in gaining some energy. My step sister visited this weekend which was really nice and allowed us to escape our small field of vision for a short while. Very needed. Family has a way of refreshing and lifting us up. My bottom is healing. I suppose the new techniques and eating little is helping. I’m trying every trick to help that heal, never experienced pain quite like that. No surgeon going to be consulted for fissures and erosions/fistulas if I have any say so in the matter. I have slept twice since I got home today. I slept several hours during the day time. I awoke in time to take my evening antibiotic. I grab a small meal, try to watch some news, talk with the girls a bit, say hello to our grand-dogter before she leaves the house, then find I can’t stay awake. I crash again into my pillow and 11pm hits. Super, just in time for my next dose of antibiotic. I find Janice has been napping on and off on the super cushy couch. Another episode of HGTV is droning on. We compare notes about a few things, then she heads off to a date with her pillow. The house is quite now. I can’t quite yawning as I type out this post. It is 12:53am on Tuesday morning and we have another appointment in a few hours. I suppose it is time to honor the yawn and go back to sleep. The cat bugs me for a moment of affection. I edit this post down a bit, look at the clock, and realize it is 1:39 am. This entry was posted in burkitts, cancer, cell, chemotherapy, healing, hope, joy, lymphoma, stem and tagged appointments, blood, busy, highway, lab, medical, pre, transplant. Bookmark the permalink. Hang tough buddy. I love your blog. Just started using word press myself.